Obi has a home! 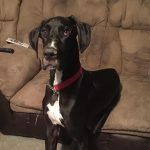 - Rocky Mountain Great Dane Rescue, Inc.
Obi has a home with Libby & Daniel and their daughter in Orem, UT. The family is elated to be able to make Obi a permanent part of their family and home. When Libby saw Obi on our website she knew that there was something special about this sweet boy and they she wanted to pursue his adoption. They’ve done extensive research on Wobblers and are prepared to ensure a comfortable life for Obi. The family enjoy time at home relaxing and also taking leisurely walks in the neighborhood. Way to go Obi!